Context: The eye lens grows throughout life by the addition of new cells inside the surrounding capsule. How this growth affects the properties of the lens is essential for understanding disorders such as cataract and presbyopia. Aims: To examine growth of the human lens in the Indian population and compare this with the growth in Western populations by measuring in vitro dimensions together with wet and dry weights. Settings and Design: The study was conducted at the research wing of a tertiary eye care center in South India and the study design was prospective. Materials and Methods: Lenses were removed from eye bank eyes and their dimensions measured with a digital caliper. They were then carefully blotted dry and weighed before being placed in 5% buffered formalin. After 1 week fixation, the lenses were dried at 80 °C until constant weight was achieved. The constant weight was noted as the dry weight of the lens. Statistical Analysis Used: Lens parameters were analyzed as a function of age using linear and logarithmic regression methods. 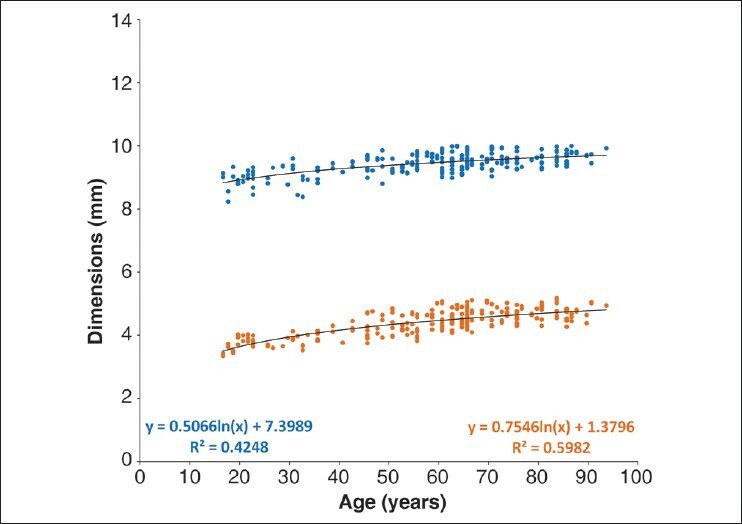 Results: Data were obtained for 251 lenses, aged 16-93 years, within a median postmortem time of 22 h. Both wet and dry weights increased linearly at 1.24 and 0.44 mg/year, respectively, throughout adult life. The dimensions also increased continuously throughout this time. Conclusions: Over the age range examined, lens growth in the Indian population is very similar to that in Western populations. The human eye lens is a unique organ; it grows continuously throughout life by the accretion of new cells which are produced in the equatorial zone of the lens and then elongate until they cover existing fiber cells inside the surrounding elastic capsule. The old cells are not shed, but instead, are densely packed into the center of the organ and their contents do not undergo any turnover. Knowledge of how this continuous growth generates the properties of the lens is important for understanding the age-related development of pathologies such as presbyopia and cataract. A lot has been learnt from observations on animals, but significant differences exist between human and non-primate lenses,  making it necessary to undertake studies on the human lens. There have been many studies on the growth of the human lens, both in vivo and in vitro. Most previous in vivo studies have been limited to the measurement of lens thickness using ultrasound or the slit lamp. , However, in vivo measurements suffer from the need to correct for sonic or optical distortions which vary with age and with the internal structure of the eye. In addition, the accommodative state of the eye markedly influences lens dimensions. Consequently, there has been little agreement between different studies. The recent application of magnetic resonance imaging (MRI)  and optical coherence tomography (OCT)  methodologies to ocular measurements has offered solutions to some of these problems, but the current MRI resolution (200 μm) is too poor for accurate measurements and OCT depends on mathematical manipulations to compute the whole lens shape as it cannot image the lens periphery; however, advances in these two technologies should, eventually, provide more uniform data on in vivo lens dimensions. Lens weights and dimensions can be more conveniently studied in vitro, where the lens is free from the influence of other ocular tissues and measurements do not require corrections. In particular, lens weights, both fresh and fixed/dried, can easily be obtained from human donor eyes. Since the first major study by Smith in 1883,  a large body of data on the changes in lens wet weight with age and limited data on lens dimensions have been accumulated from measurements in numerous laboratories. Unfortunately, there are huge variations in the data, most of which can be attributed to the effects of prolonged eye bank storage, generally beyond the control of the investigator, or differences in tissue handling. ,, These have led to various contradictory conclusions regarding lens growth, as well as lens properties. Analysis of published and unpublished data has revealed that growth in human lens wet weight is biphasic, asymptotic before birth, and linear postnatally. , The transition in growth pattern appears to occur at or very shortly after birth, with the completion of the clinically defined adult nucleus, but the available data are too variable to pinpoint the time or to accurately describe further postnatal growth. There is a great need for more reliable data collected under carefully controlled conditions to define growth more precisely. Although the simplest way to assess lens growth is by determination of changes in wet weight, the measured wet weight may not be indicative of the amount of tissue laid down. Human lenses are generally obtained from eyes that have been stored for variable times in eye banks. During such storage, water may be taken up by the lens, increasing its weight. Since there is no loss of cells or their contents (other than water), a more reliable assessment of lens growth would be to measure the accumulation of protein/dry matter. Such an approach, in which the lens is fixed and then dried, is commonly used in methods for determining the ages of animals culled in the wild. ,, Dry weight determination is generally not done with human lenses since it would spoil the precious lens for any further studies. Consequently, very little is known about the increase in dry weight with age. Such data would be valuable in assessing the extent of compaction in the aging lens and its relationship to the development of presbyopia. The purpose of the current study is to undertake a long-term investigation, which attempts to overcome some of the difficulties of the past by measuring both wet and dry weights and dimensions of lenses collected at a single site from a racially uniform Indian population, using a rigorously followed protocol, which reduces the risk of postmortem changes. Of particular interest are the changes in lens dry weight with age. The data from this study are compared with data obtained from western populations. It is expected that access to a large number of lenses, improved handling methods, and the measurement of several parameters on each lens will provide valuable and reliable information on the growth of the human lens. The donor tissues used in this study were received from the eye bank belonging to a tertiary eye care center in South India. The age, gender, time of death, time of enucleation, cause of death, postmortem time, and time of use were noted for each eyeball used. Lenses were obtained from donor eyeballs after their corneas were removed under sterile conditions for the purpose of transplantation. Eyes obtained more than 4 days postmortem were rejected. The iris was excised first and then the lens was extracted with a lens spoon after freeing it from the zonular attachments with Vannas scissors. The lens was then carefully blotted dry and its dimensions (diameter and thickness) were measured with a digital caliper (INOX IP54 Caliper, Micro Precision Calibration Inc., Grass Valley, CA, USA). Lenses with visible capsular damage or cataract were excluded from the study. The lens was weighed using an analytical balance (KERN ABS 120-4, Kern & Sohn GmbH, Balingen-Frommern, Germany) before being placed in 5 ml of 5% buffered formalin in small glass containers. After 1 week fixation, the lenses were dried at 80°C in a hot air oven (Sisco, Thane, India) until constant weight was achieved. This complete drying of lenses typically took around 2 weeks. The constant weight was noted as the dry weight of the lens. Some lenses were also obtained from eyes used for experiments on the optomechanical responses of the lens while mounted in a lens stretcher. After cutting the zonules, the lens was carefully removed from the tissue framework mounted in the Dulbecco's Modified Eagle's Medium (DMEM/F-12, D8437, Sigma, St. Louis, MO, USA) filled tissue chamber of the stretcher. The dimensions and weights were measured as described above. The data from these lenses were examined to determine if the stretching experiments had affected their properties. This was found not to be the case as the changes in dimensions after the experiments were within 1.1% (median) of unstretched lenses of the same age. Data were obtained on 251 lenses collected between 2009 and 2011. The ages of the donors ranged from 16 to 93 years; males numbered 152 and females 99. The median postmortem time was 22 h (inter-quartile range, 17-27 h). Seventeen lenses had been used for optomechanical stretching experiments. Since no significant differences were found between these and other lenses of comparable ages, all data were combined. Lens wet and dry weights and dimensions were plotted against age, and regression analyses (linear and logarithmic) were used to fit the data using Microsoft Excel 2007. Since lens growth commences early in gestation,  all ages cited are since closure of the lens vesicle (approximately 38 days since conception). Any data more than three standard deviations (SDs) from the mean for any age were eliminated. This resulted in seven wet weight and five dry weight points being eliminated. The consent to enucleate eyes for the purpose of transplantation, therapy, medical research, or education was obtained by the eye bank in accordance with its practices and procedures. The study protocol was approved by the Institutional Ethics Committee attached to the tertiary eye care center (approval number LEC 08025 dated 23 December 2008) and adhered to the tenets of Declaration of Helsinki. The dimensions (diameter and thickness) of the lenses are shown in [Figure 1]. Diameter increases continuously from around 9 mm at age 16 years to near 10 mm at age 90 years (diameter = 7.40 + 0.51 × ln(age), R2 = 0.43, P < 0.0001). The thickness also increases from age 16 years (thickness = 1.38 + 0.76 × ln(age), R2 = 0.60, P < 0.0001). The aspect ratio (thickness: diameter) reflects these changes [Figure 2]. The data suggest that the ratio may increase with age at around 0.001/year (aspect ratio = 0.40 + 0.001 × age, R2 = 0.40, P < 0.0001), consistent with the difference in the rates at which thickness and diameter increase. 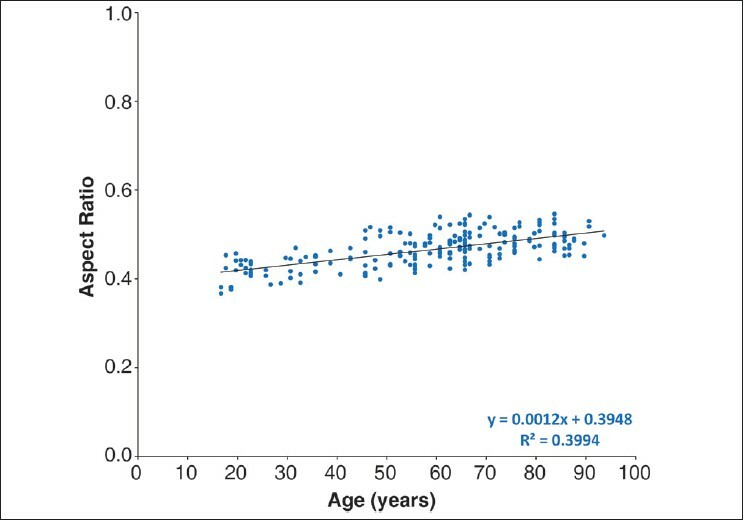 As can be seen in [Figure 3], lens wet weight increases linearly from around 160 mg at 16 years of age to over 250 mg by 90 years of age [wet weight = 146.04 (±3.50) + 1.24 (±0.06) × age, R2 = 0.67, P < 0.0001]. This is very similar to the trend reported earlier by Augusteyn. However, the scatter in the data is substantially less, probably reflecting the more controlled lens isolation conditions in the present study compared with the previous one. 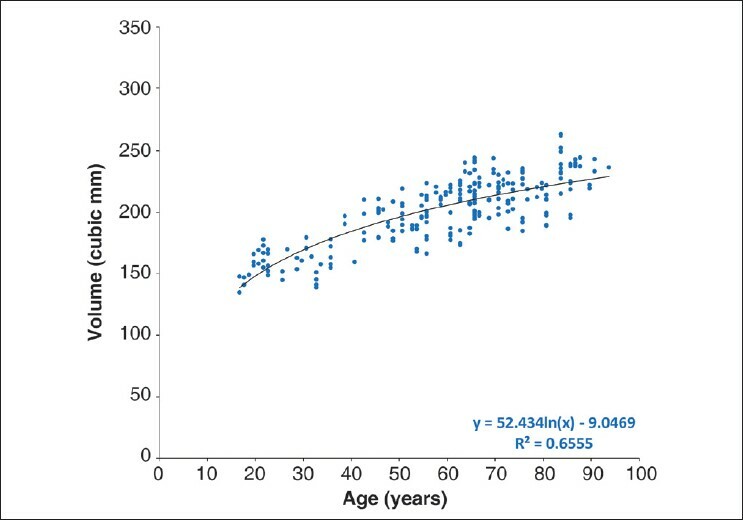 [Figure 4] presents the lens dry weights as a function of age. The dry weight also increases linearly throughout life from around 50 mg at 16 years of age to around 85 mg by 90 years of age. Regression analysis shows the rate of increase to be 0.44 mg/ year [dry weight = 47.05 (±1.15) + 0.44 (±0.02) × age, R2 = 0.69, P < 0.0001]. 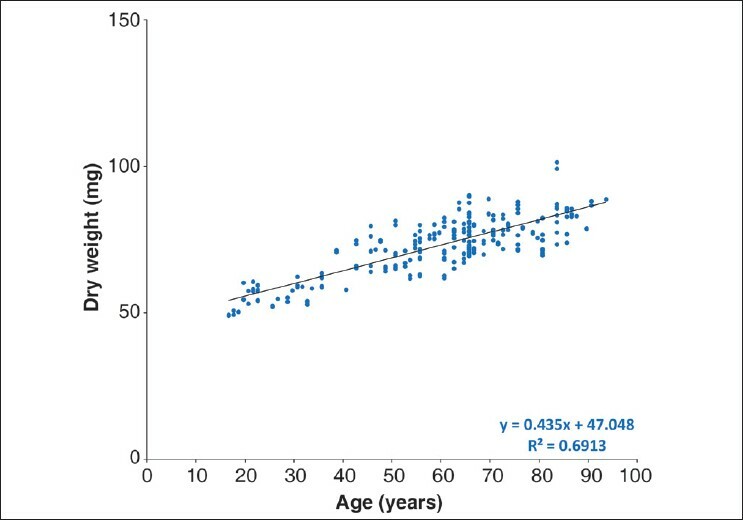 The average lens dry weight increases from ~31% to ~34% of the lens weight over the age range studied. This corresponds to an increase in the concentration from 330 to 370 mg/ml. The availability of both wet and dry weights makes it possible to calculate lens volumes. Assuming that dry weight represents essentially only protein, the partial specific volume of lens proteins (0.75) can be used to derive the formula: volume = wet weight - (0.25 × dry weight). The change in the calculated volume with age [Figure 5] can be described with the logarithmic expression: volume = 52.43 × ln(age) - 9.05 (R2 = 0.66, P < 0.0001). The volume of the lens, which is around 150 mm 3 in the late teens, reaches around 230 mm 3 by the age of 90 years. The postmortem time was included as an independent variable and multiple regression analysis was done to study its possible effect on the dependent variable. The results showed that the postmortem time did not have a significant effect on the dependent variables diameter (P = 0.20), thickness (P = 0.97), aspect ratio (P = 0.52), wet weight (P = 0.82), dry weight (P = 0.11), and volume (P = 0.89). Among the most debilitating of ocular dysfunctions are the development of presbyopia and senile cataract. , Both can be attributed to age-related alterations in the lens. Detailed knowledge of the growth and biophysical properties of the lens, and their variations with age, is essential for understanding how these age-related visual disorders develop and how they might be treated or prevented. Although a number of previous studies have examined various lens biophysical properties, , most have been limited in scope and examined only small numbers. Consequently, very little information is available on the actual growth of the lens. In addition, there are considerable differences between observations and conclusions from different laboratories. The present study has been undertaken with the intent of collecting comprehensive data on lens growth by making multiple measurements on individual, freshly obtained lenses, covering the whole of the life span. To date, valuable information on the growth of the lens had been obtained by measurement of weights and dimensions on a large number of postmortem human donor lenses (n = 251). Although there is a lack of data on the lenses of younger age, in particular on the lenses from the first few years of life, a large enough number of lenses had been collected to permit this preliminary analysis on adult lens growth. Previous studies have shown that water uptake takes place rapidly in the lenses left in the eye for extended periods (beyond 30 h postmortem). , This might be responsible for the huge variations in wet weights of human lenses observed in earlier studies. , The variation was much less in the present study and only seven lenses had to be eliminated in the present analysis because they were more than three SDs from the mean. This low attrition can probably be attributed to the following reasons: the data were collected from fresh human donor lenses with shorter postmortem times (median of 22 h), the use of a single collection protocol and, possibly, the racially more uniform Indian population from which the lenses were collected. The growth in lens weight in most species is asymptotic, slowing gradually throughout life. This can be adequately described with many of the self-limiting growth equations, such as the logistic and Gompertz functions. However, attempts to fit the adult human data to such functions were not successful, as has been noted previously. This is because human lens growth takes place in two distinct modes: asymptotic during prenatal life and for a very short period postnatally, followed by a linear mode thereafter for the remainder of life. The growth in adult population observed in the present study is similar to that reported for the Western population. The wet weight of the Indian lenses increases at a rate of 1.24 mg/ year throughout the lifespan comparable to the 1.38 mg/ year reported earlier by Augusteyn. This is consistent with continued growth of the lens diameter. The slight difference in the rates could be due to the fact that the lenses were collected under more carefully controlled conditions and at shorter postmortem times. As there is no turnover of cells or proteins inside the lens capsule, the accumulated protein content or dry weight provides a reliable measure of lens growth and can be used for determining age. This approach has been applied to many species in wildlife control programs. , In order to obtain further information on human lens changes with age, we have also measured dry weights. To the best of our knowledge, this is the first study to report dry weights on a large number of human lenses from adult donors. The dry weight of the lenses from the Indian population increased steadily at a rate of 0.44 mg/year. From around 50-55 mg at age 17 years, the dry weight reaches a value of 85-90 mg by 90 years. This linear model of growth would permit simple determination of adult human age from lens dry weight. Such information could find application in forensic medicine. It had been expected that the variability in dry weights would be significantly less than that in the wet weights. This did not appear to be the case, possibly because the variability in wet weights had been reduced by the shorter postmortem times. However, it was noted that for many lenses, all parameters measured indicate that the age may have been greater than that written in the medical records, i.e. the apparent scatter was not due to random errors or variations in the measured parameters, but rather could be attributed to incorrect ages. Given the nature of the population from which the lenses were obtained, this is highly likely. Based on the partial specific volume of proteins (0.74-0.76 ml/g), the calculated volume of lens increases from around 150 mm 3 in teens and reaches a maximum of 240 mm 3 in the elderly. This is very similar to the observations estimated by computing the solid of revolution of the cross-sectional plane of postmortem lenses around the optical axis. Our measurements are much more accurate than those from the ellipsoid calculation frequently used and simpler to perform than the complex algorithms sometimes used. Since the calculation of volume from weights would destroy the lens, it is necessary to complete all other studies on the lens before fixation and drying and, as long as there is no damage to lens, this will yield accurate volumes. To conclude, the preliminary observations show that the growth of the human lens in the Indian adult population follows the linear portion of the biphasic pattern described earlier. Over the age range examined, lens growth in the Indian adult population appears to be very similar to that in Western populations. However, insufficient data are available for early ages to determine if the prenatal growth is also the same. It is intended to continue with the collection of data in this project until this shortfall is overcome. The authors are grateful to the staff of Ramayamma International Eye Bank, L V Prasad Eye Institute, Hyderabad, India for providing tissue specimens. The authors thank the surgeons Esdras Arrieta-Quintero and Mukesh Taneja for training in surgical dissection and Derek Nankivil and Pesala Veerendranath for assistance with the measurements. Professor Jean-Marie Parel, Ophthalmic Biophysics Center, Bascom Palmer Eye Institute, University of Miami Miller School of Medicine, Miami, USA provided valuable feedback on this manuscript. This work was supported by the Hyderabad Eye Research Foundation, Hyderabad, India and, in part, by NIH Research Grant R01EY014225. Augusteyn RC. Growth of the lens: in vitro observations. Clin Exp Optom 2008;91:226-39. Dubbelman M, Van der Heijde GL, Weeber HA, Vrensen GF. Changes in the internal structure of the human crystalline lens with age and accommodation. Vision Res 2003;43:2363-75. Kasthurirangan S, Markwell EL, Atchison DA, Pope JM. MRI study of the changes in crystalline lens shape with accommodation and aging in humans. J Vis 2011;11:19, 1-16. Baikoff G, Lutun E, Wei J, Ferraz C. Anterior chamber optical coherence tomography study of human natural accommodation in a 19-year-old albino. J Cataract Refract Surg 2004;30:696-701. Smith P. Diseases of crystalline lens and capsule. 1. On the growth of the crystalline lens. Trans Ophthalmol Soc U K 1883;3:79-99. Augusteyn RC. Growth of the human eye lens. Mol Vis 2007;13:252-7. Augusteyn RC, Cake MA. Post-mortem water uptake by sheep lenses left in situ. Mol Vis 2005;11:749-51. Augusteyn RC, Rosen AM, Borja D, Ziebarth NM, Parel JM. Biometry of primate lenses during immersion in preservation media. Mol Vis 2006;12:740-7. Augusteyn RC. On the growth and internal structure of the human lens. Exp Eye Res 2010;90:643-54. Augusteyn RC, Coulson G, Landman KA. Determining kangaroo age from lens protein content. Aust J Zoology 2003;51:485-94. Dudzinski ML, Mykytowycz R. The eye lens as an indicator of age in the wild rabbit in Australia. CSIRO Wildl Res 1961;6:156-9. Augusteyn RC, Mohamed A, Nankivil D, Veerendranath P, Arrieta E, Taneja M, et al. Age-dependence of the optomechanical responses of ex vivo human lenses from India and the USA, and the force required to produce these in a lens stretcher: the similarity to in vivo disaccommodation. Vision Res 2011;51:1667-78. Strenk SA, Strenk LM, Koretz JF. The mechanism of presbyopia. Prog Retin Eye Res 2005;24:379-93. Vashist P, Talwar B, Gogoi M, Maraini G, Camparini M, Ravindran RD, et al. Prevalence of cataract in an older population in India: the India study of age-related eye disease. Ophthalmology 2011;118:272-8 e1-2. Sharma PK, Busscher HJ, Terwee T, Koopmans SA, van Kooten TG. A comparative study on the viscoelastic properties of human and animal lenses. Exp Eye Res 2011;93:681-8. Burd HJ, Wilde GS, Judge SJ. An improved spinning lens test to determine the stiffness of the human lens. Exp Eye Res 2011;92:28-39. Van Heyningen R. The human lens. 3. Some observations on the post-mortem lens. Exp Eye Res 1972;13:155-60. Spencer RP. 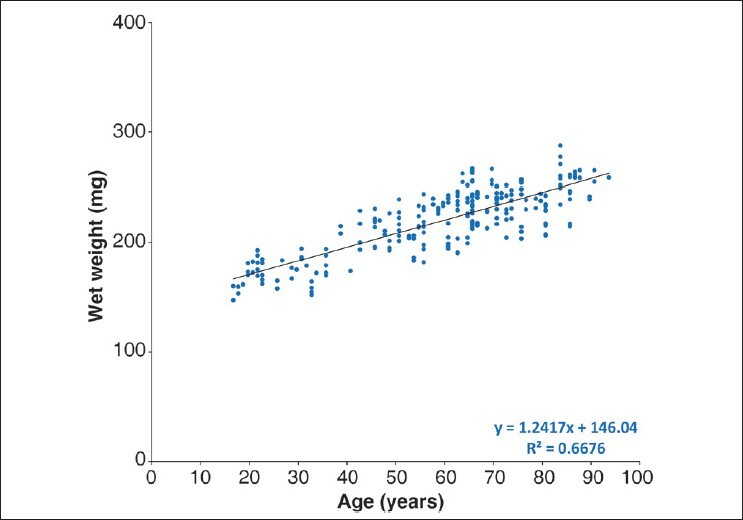 Change in weight of the human lens with age. Ann Ophthalmol 1976;8:440-1. Rosen AM, Denham DB, Fernandez V, Borja D, Ho A, Manns F, et al. In vitro dimensions and curvatures of human lenses. Vision Res 2006;46:1002-9. Lord DR. The lens as an indicator of age in cottontail rabbits. J Wildlife Mgment 1959;23:358-60. Lahm D, Lee LK, Bettelheim FA. Age dependence of freezable and nonfreezable water content of normal human lenses. Invest Ophthalmol Vis Sci 1985;26:1162-5. Urs R, Manns F, Ho A, Borja D, Amelinckx A, Smith J, et al. Shape of the isolated ex-vivo human crystalline lens. Vision Res 2009;49:74-83. Mohamed, A., Gilliland, K.O., Metlapally, S., Johnsen, S., Costello, M.J.